Why do we need a Stand Steady X-Elite Pro? The X-Elite Pro by Stand Steady has been a very popular sit-to-stand converter that can easily help with your ergonomics and back pain. 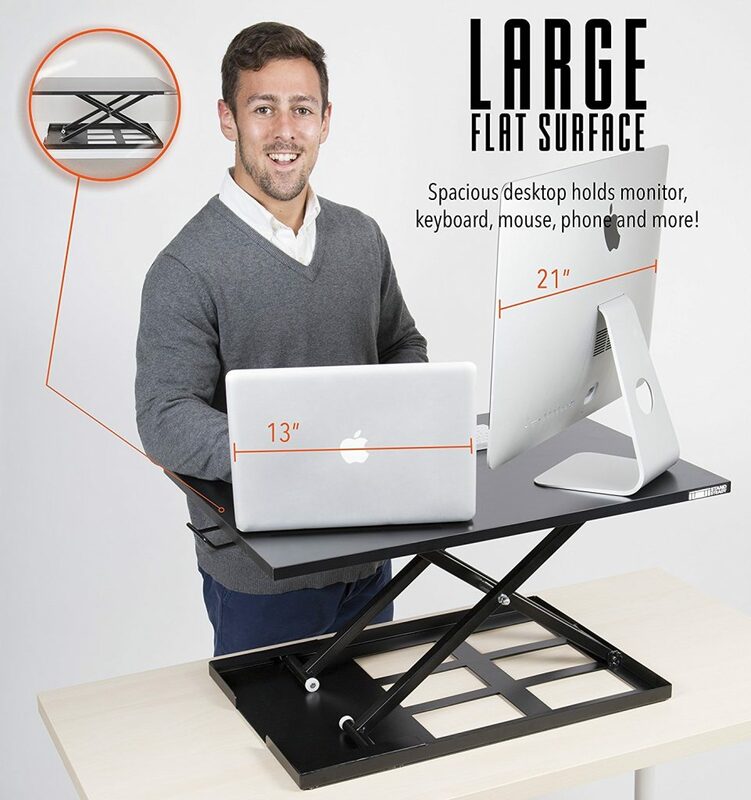 The desktop surface is 28″ by 20″ and the base surface is 16.8″ by 24.5″. You’ll be able to adjust the height of the standing desk convert from 16″ (the highest) down to 5″. It can go flat, however, if you’re trying to lower from 5″ to flat, it sinks quickly, which is why Stand Steady advertises it to 5″, for the user experience. The Stand Steady’s X-Elite Pro is just a flat surface (without a keyboard tray) and it uses uses an air pump lift mechanism. The pump lift system works by pulling levers on each side of the converter and then pushing down. Because of its unique design of the base, it can adjust anywhere between the 16″ and 5″, instead of interval adjustments. Stand Steady’s X-Elite Pro is good for people with bad backs. You won’t have to suffer anymore! 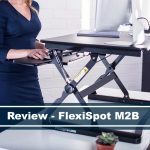 It reduces neck, back, and leg pains, and you can comfortably sit and stand as you work. It enhances your posture because standing strengthens a person’s core strength. You just have to make sure that the height of the desk suits you or you’ll end up hurting your back even more as you slouch. If you are weight-conscious, this desk can help you stay in shape. Standing helps burn calories and reduces the risk of obesity. It lowers your chances of contracting long-term health problems like cardiovascular diseases, diabetes, and cancer. It increases your energy levels, which enhances your mood, focus, and productivity. Like any other standing desk, this works right out of the box. There’s no need for any installation, and the X-Elite Pro weighs about 27 pounds. The desk is flat and wide. It is well-built and remains sturdy even at maximum extended height. The desktop is made of laminated particle board while the base and legs are made out of steel, making it quite a steady standing desk. The transition from sitting to standing is smooth and fast. 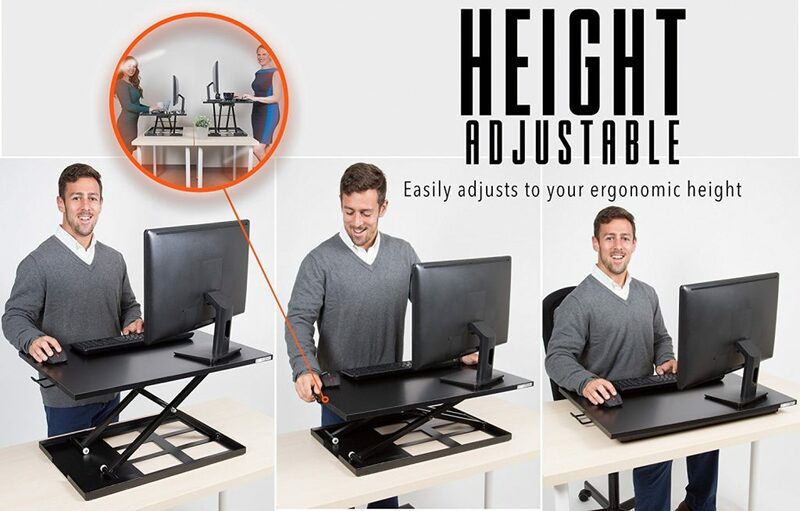 The premium assisted lift makes it easy to adjust the desk from sitting to its maximum extended height in a matter of seconds. You just have to press and lift the lever or handle to raise the table to a standing position, and release the handle while pushing the surface down to lower it when you are sitting down. One issue people complained about is when they try to lower the desk for the first time. Most, if not all find it quite difficult. But let us consider that like breaking in a new pair of shoes. The transition from sitting to standing should work smoothly after that. Also, it can be a bit challenging in a sitting position. Most users still find the lowest setting to be too high, which is not too ideal for sitting down. To work around it, users have to adjust on their end by adding height to their seat or use casters to raise it a little bit. The ergonomic height range of this desk is 5 to 16 inches and can be lowered to flat when you are in sitting position. People who are over 6 feet tall do not have to worry about the extended height being a little bit too low and uncomfortable. The surface space of the desk is 28 inches x 20 inches, which can fit a dual-monitor setup (depending on the size of the monitor), a keyboard and mouse, and some more space to spare. However, we like to use a 27″ iMac with a laptop. 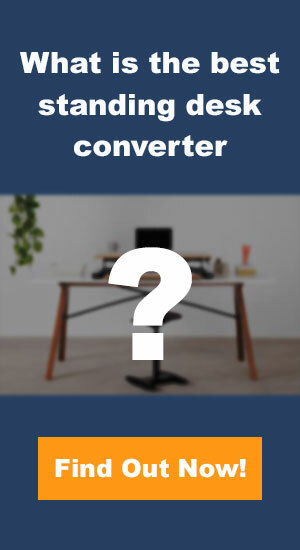 Because the desk converter is a flat surface, it may be necessary for you buy a separate keyboard tray to make it more comfortable in the sitting position because you might feel like the space for the keyboard is a little bit too high. The desk is sturdy enough to handle 27 pounds of weight, but adding movement of lowering or raising the desk might be pushing it too far. Some users struggle to move the desk with all their desktop items on it safely. This is something you might want to consider before buying this product especially when you have a huge and heavy monitor like an iMac. The desk is sturdy, but only to a certain limit. Naturally, if your monitor and other desktop items are heavy, the desk might wobble. More so if you pound on your keyboard as you work in a standing position. This is something you should consider about if you don’t want to worry all the time about the desk crashing with all your desktop items on it. The X-Elite Pro lifts upwards instead of coming towards you. For some consumers, this is preferred because it only takes up the space of the converter. It comes in different colors. If you value aesthetics in your workspace, this is a cool feature that you’d surely be happy about. The surface of the desk gets fingerprints easily, though. If you are a little bit of a nitpicky person, this is probably something you would be annoyed about. But ergonomics wise, the desk design is great. This desk is very affordable. It costs only half the price of other best-selling standing desks on the market today. In summary, this desk is simple, easy to use, and cheaper than its rivals. If you are still not decided on whether it is worth it to purchase this desk or not, let us round up all its pros and cons. 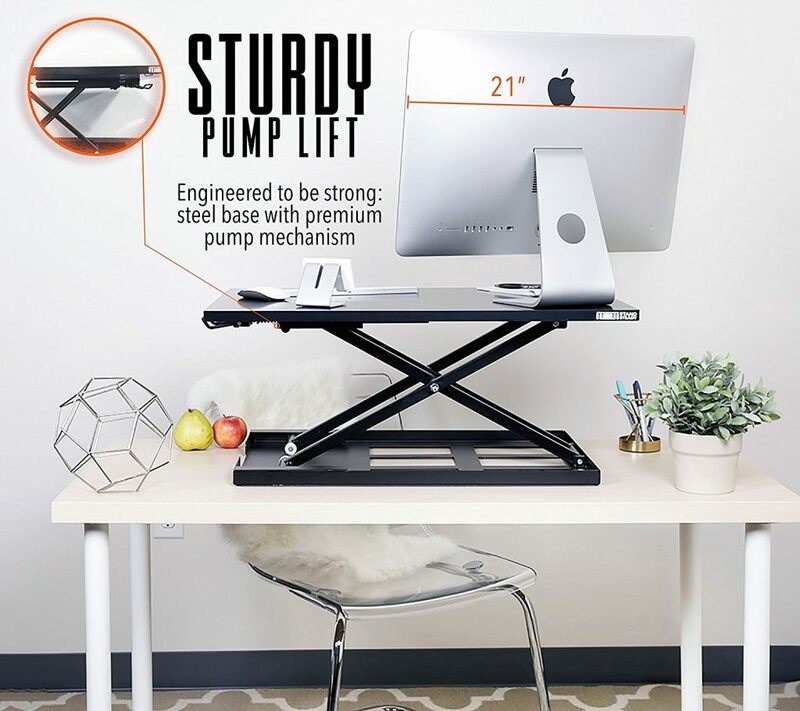 Stand Steady competes well with the more expensive Varidesk brand. This offers the same benefits of a any varidesk competitor at a lesser price. We like how its more flexible, in terms of height, than other standing desks. The Stand Steady X-Elite Pro is simple and easy to get you from sitting to standing right out of the box. If you are looking to buy a simple desk that works at an affordable price, this one is great. 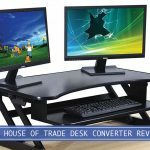 However, if you’re still looking around, take a look at the reviews we’ve done with other standing desk converters here. This standing desk significantly helps people with bad backs and extremely beneficial for your health and productivity. There is no need for assembly or installation. The desk is ready to use. Premium assisted lift allows an easy transition from sitting to standing. Height range works even for people who are over 6 feet tall. The work surface is flat and wide. It fits a two monitor setup, keyboard and mouse, and your desktop items. Lowering the desk for the first time is difficult. It gets wobbly when your desktop items are heavy and when you put too much pressure on it or when you pound on your keyboard while the desk is in its extended height. It does not lower all the way down when you are in a sitting position. You might have to buy a separate keyboard tray. Moving the desk is difficult with all your desktop items on top of it.